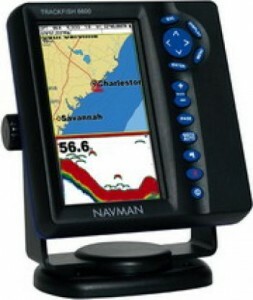 •C-Map NT+ and NT Max chart plotter with 2 cartridge slots for a wider coverage. •50/200 kHz dual frequency fishfinder with an amazing 600 W RMS power output (4800 W peak to peak), to rech depths up to 600 m / 2000 ft.
•Track-Your-Buddy function, when connected to a VHF 7200 : displays the real-time position of 3 friends on the chart. The TrackFish 6600 large 7" display (178 mm) provides multiple display options, with an unparalleled bright screen and high resolution. 800 x 480 pixel resolution, for a highly detailed chart and sonar info.